Everyone knows that outdoor air is filled with pollutants. But did you know that the air in your home may be just as bad? In fact, the EPA ranks indoor air quality as a top five environmental concern. And the air inside can be up to 100 times more polluted than the air outside. The reason: dust, pollen, mold, bacteria, pet Remove these particles, and you remove the common triggers for allergies, asthma attacks, headaches and other health worries. Fortunately, there's an uncomplicated way to do just that. An Affinity Whole Home Air Cleaner is an easy way to improve indoor air quality. These air cleaners go far beyond standard filters to keep your home environment cleaner all year long. Unlike a portable room air cleaner, these units are part of your existing heating and cooling system, so they clean the air throughout your entire home, all while remaining out of sight and operating incredibly quietly. The media air cleaner permanently traps particles, including airborne contaminants, down to 1 micron (one millionth of a meter in size). Particles less than 6 microns are invisible to the naked eye, and allergy-causing pollen particles and mold spores range from .5 microns to 1 micron. Your media air cleaner simply attaches to your existing heating and cooling equipment. It uses no extra electricity, requires no continual maintenance and operates silently. Inside, the disposable media filter lasts up to two years, so you don't have to worry about constant changes, or even cleanings. 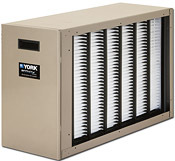 Your York Dealer can replace filters as part of a regular maintenance schedule. The Opti-Fiber Media delivers a Minimum efficiency Reporting Value (MERV) 10 with low performance pressure drop. The spun bonded fibers are free of any chemical binders and are hydrophobic (do not absorb moisture). With a high initial efficiency, the Opti-Fiber Media resists shredding for reliable and dependable dust-fighting capabilities. Available i16" x 25" or 20" x 25" cabinet with a 5" deep mediacore. Air cleaners with Opti-Fiber Media efficiently remove airborne microscopic particulates at 61.8 percent minimum average efficiency at 1.0 to 3.0 microns. The most efficient holding capacity among other residential air cleaners, the MAC11162506 removes pollen, mold, dust, animal dander, grease, soot, and tobacco smoke for cleaner, fresher air in your home. The MERV 11 no-tear microfiber expandable media is strung for easy media replacement. The very low pressure drop media characteristics allow for better heating and cooling equipment operation. The efficient media design extends filtration effectiveness. The microfiber media replacement interval is every 12 months, versus cartridge media filters required at 6 months. The highly efficient, microfiber expandable media meets MERV 11 test standard ANSI / ASHRAE 52.2-1999. York Air Cleaners with microfiber expandable media efficiently remove airborne microscopic particulates at 75 percent minimum average efficiency down to 0.01 microns. HEPA (high efficiency particulate arrestance) filters are used in hospitals because they are considered the best filters on the market today. A filter must collect 99.97 percent of a specific particulate that measures 0.30 microns in a test established by the Institute of Environmental Sciences in order to receive the HEPA filter designation. However, the HEPA filter can capture 100 percent of all particulate sizes ranging from >100 microns down to 0.01 microns. 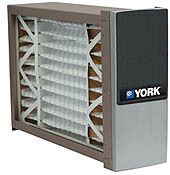 The York Air Cleaner delivers the relief you have hoped for and expect. 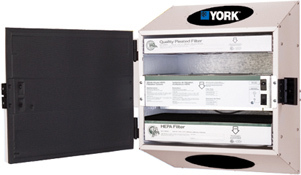 The York HEPA filter is designed to be directly mounted on the return air duct or may be mounted remotely with an optional kit. Our use of an advanced pull and push design offers a double sound barrier. The motor pulls the air through the pleated filter and charcoal filter, then pushes it through the HEPA Media Filter which acts as a double sound attenuator. The process is very quiet, and with zero pressure drop, will not interfere with the ability of the heating/cooling system blower to deliver clean, safe, healthy air to the building.